The top attorney for General Motors (GM), Michael Millikin, said some of his staff "didn't do their jobs" and "didn't do what was expected of them" in handling the ignition-switch defect that has been linked to 13 deaths. Those attorneys are no longer at the automaker, he added. Millikin, who spoke at a Senate Commerce, Science and Transportation subcommittee hearing on Thursday, said he didn't learn about the ignition-switch defect until early February. "I immediately took action," he said. "Had I learned about it earlier, I would have taken action earlier." The actions -- or inactions -- of attorneys at General Motors came under fire during the hearing, with Senator Richard Blumenthal (D.-Conn.) decrying the company's legal department for "coverup, concealment, deceit and even fraud." General Motors has recalled almost 26 million cars in the U.S. this year, while investigations have revealed that the automaker knew about the ignition-switch flaw years earlier. The automaker has fired 15 employees for their role in the defect. 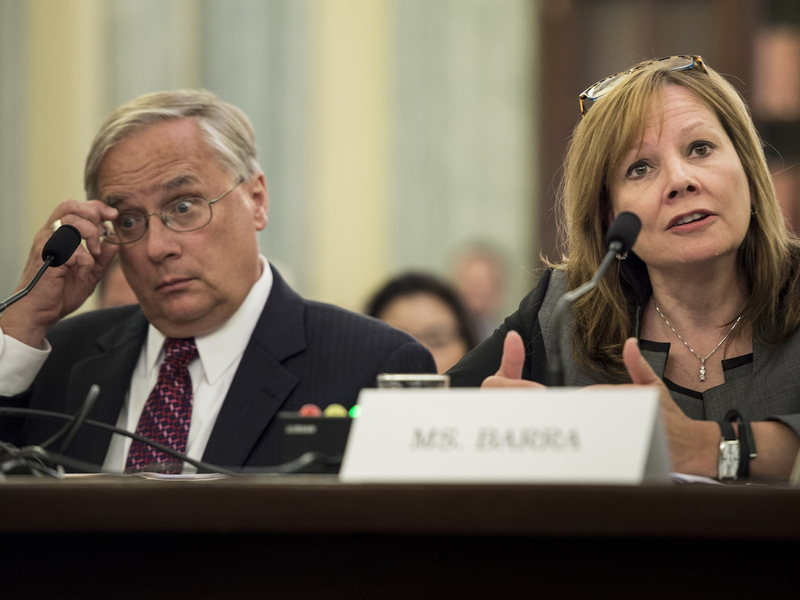 General Motors chief executive Mary Barra, who also spoke at the hearing, said the company wants "to stand as the company that is setting the new industry standard for safety," and vowed that her employees wouldn't forget what caused the recall. "We accepted responsibility for what went wrong. I told the men and women of GM that our actions will be guided by two clear principles: We will do everything within our power to make sure this never happens again," Barra said. "And, we will do the right thing for those who were harmed." Senator Claire McCaskill (D.-Missouri) opened the hearing by criticizing GM's "outrageously incompetent management." She added, "How in the world did Michael Millikin keep his job?" McCaskill later pressed Barra about Millikin, telling her she didn't "get" while the general counsel was still employed. "I need the right team," Barra responded. Millikin "has high integrity. He's the person I need on the team. He had a system in place, and in this instance, [the ignition-switch defect] wasn't brought to his attention." "The failure of this legal department is stunning," McCaskill responded. Compensation expert Kenneth Feinberg also spoke at the hearing, explaining how a program to compensate victims of the ignition-switch defect would handle claims. The fund doesn't have a cap on compensation, but is limited to claims linked to eligible vehicles and those that suffered an air-bag deployment failure, which indicates the ignition-switch defect may have been to blame, Feinberg said. The fund will begin taking claims next month, while Feinberg emphasized the goal of distributing compensation "as quickly and efficiently as possible."